A Photograph of the Prophet Elijah? Is There Too Much Religion in Science Fiction? The Face of Saint Euphemia Still Incorrupt! The Spirits of Diveyevo Nuns Photographed? How About A New Slogan? Joseph Smith: "I Will Be A Second Muhammad"
The Holy Monastery was founded as Patriarchal and Stavropegic and was dedicated to the Holy Trinity, following a Divine Revelation given to St. Dionysios. Later on, the name of its founder predominated. St. Dionysios created a monument of rare architectural and aesthetic beauty, ideally integrated into the natural environment; built as a fortress, from stone and wood, on a natural fortified plateau. Thanks to St. Dionysios΄ blessings, despite the numerous destructions, the Monastery has been enjoying continuous life and a monastic presence for about 500 years. Due to St. Dionysios΄ personality, it soon became widely known and developed great spiritual activity, in line with its founder΄s pattern. 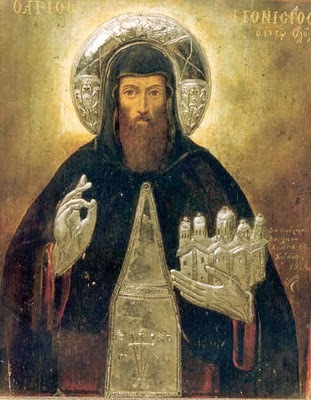 Centuries ago, the reputation of the old Monastery surpassed the boundaries of the Greek territory reaching Tsarist Russia. Even today, thousands of people, coming from both neighboring and distant areas, come to worship and pray to the Saint. The Monastery of St. Dionysios became an integral part of Greece΄s long history, society and education. There was an organized icon painting workshop and manuscript transcription center, in which many old texts have been preserved. The Monastery΄s school was attended by many pupils, including the areas΄ great chieftains, perhaps even Rigas Fereos. The Monastery however was destined to be afflicted, suffer the price for its contribution to the education of the faithful, to the protection of traditions. In 1821, it was set afire by Veli Pasha, son of Ali Pasha. After a three-day battle, Abbot Methodios Paliouras was hanged along with another 12 monks at the central square of Larissa. During the Olympus Revolt in 1878, the Monastery took an active part by providing shelter to the women and children of Litochoro; it disrupted for the first time the entrance prohibition for women. The Metochion of Skala was used as a replenishment and disembarkation station for the Greek fighters. During the Macedonian Struggle, it constituted again shelter for the fighters and a replenishment station. Despite all the successive natural or volitional destructions and the ceaseless pillages, the Monastery kept on protecting the inhabitants of Mt. Olympus under its sacred shadow. Because the Monastery is in disrepair, in the 1950's a new Monastery was built nearby where the monks live today. The feast of St. Dionysios is January 23rd. Read more about St. Dionysios and his Monastery here and here.